In 1972, the Brecksville Police Department began one of the first Safety Town Programs in Northeast Ohio. Since then, thousands of children about to enter kindergarten have graduated from Brecksville Safety Town. Safety Town is an early education program designed for children entering kindergarten. Children attend Safety Town 2 hours per day for two weeks. During that time they learn about a variety of safety topics taught by Brecksville Police Department staff and a wide variety of guest speakers including but not limited to firemen, nurses, park rangers, and lifeguards. Many of the safety lessons are followed up with arts and crafts projects, books and videos, and exercises. A miniature town complete with streets, houses, traffic signs and a working traffic light is set up outside the classroom. Children learn traffic signs and rules as they drive peddle cars around the town. They can also park their cars and practice pedestrian safety on the town’s sidewalks and crosswalks. Safety Town falls under the leadership and guidance of Officer Mark Kryznowek and Clerk Donna Rees. Officer Mark Kryznowek has been with the department for 20 years and has worked with Safety Town and other juvenile programs exclusively for the last several years. 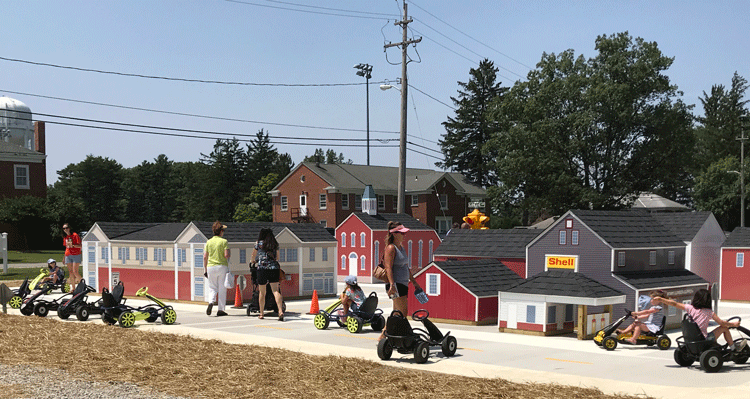 Clerk Rees is the only person who has been involved with Brecksville Safety Town every year since its inception in 1972. From 1972 until 1982, Dispatcher Rees was a volunteer at Safety Town. Beginning in 1982 until present day, Rees, who is also a certified teacher, has served as Brecksville Safety Town teacher. Kryznowek and Rees work well together and their commitment and dedication to the children and program are one of the reasons that Brecksville’s Safety Town is a model to others. The police department is also thankful for the support of the Brecksville-Broadview Heights Pre-School Mother’s Club who has been an important part of our program for many years. The Pre-School Mothers Club has helped with everything from registration to providing refreshments at graduation. Their support is greatly appreciated. The Brecksville Police Department announces the dates for Safety Town In February. There is a small fee of $20. Class size is limited and will be filled on a first-come, first serve basis. Volunteer applications will not be accepted until after March 1. Is the program everyday and for how long? Typically children attend Safety Town 2 hours per day every day for 2 weeks. On occasion the 4th of July holiday shortens the program to 9 days instead of 10. My child is going into first grade but has never attended Safety Town, can they still attend? Yes, if a child is entering first grade and for some reason has not attended Safety Town, they are eligible to sign up. However, the program is intended and recommended for children entering kindergarten. 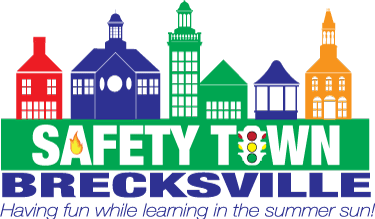 Can my children attend Brecksville Safety Town if we do not live in Brecksville? Yes. Children outside of Brecksville are welcome to attend our Safety Town. We firmly believe it is an important program that every child should have the opportunity to attend. However, residents of Brecksville will be given preference in selecting class dates and times. Are there a maximum number of students per class? As mentioned earlier, we firmly believe that Safety Town is an important program that every child should have the opportunity to attend. We do not limit the number of registrations that we accept, however we do manage class sizes to promote an optimal learning environment for the children. This means a class will be available to attend, but it may not be the class date or time you prefer. Do I have to stay with my child at Safety Town? On the first day of Safety Town, you will be required to stay with your child for the first 20 minutes of the class for orientation. You are also required to stay with your child on the last day of Safety Town for graduation. Other than that you do not need to stay with your child. What are the hours for the volunteers? Volunteers should arrive at 8:30 am and will be done by 2:00 pm. They will have a 45 minute break for lunch and should bring a lunch with them every day. To register online through WebTrac, click here.